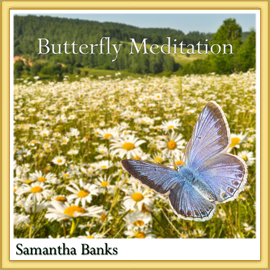 Butterfly Meditation: Just like the butterfly we go through many metamorphosis's and cycles in our lives, sometimes it can be difficult to see the changes that are or need to take place, when if we would only let go and let life happen we would see the miracles and the beauty. In this meditation, Samantha takes the listener on a journey of transformation, it is the intention that the listener will gain a sense of awareness and understanding of the many transformations that are happening on a daily basis and be able to flow with them. Just like the Butterfly you can explore all the aspects of your own transformation and allowing as oppose to fighting brings many rich experiences that would have otherwise been missed. Once the Butterfly completes it's transformation through the different stages she spread her beautiful wings and flies, butterfly is calling you to your very own transformation.